At the beginning of the last century. Stokes Bay with its fine uninterrupted view of the Solent and the Isle of Wight, its beach and its good fishing became recognised as a most desirable place to live. It attracted people like Lord Ashburton, the Marchioness of Bath. the Rt. Hon. John Wilson Croker who built the Alverbank, senior naval and military officers and many distinguished people. In 1826 the Marquis of Anglesey laid the first stone of what later became the Village of Anglesey or Angleseyville. The village boasted a commodious Bath House, Reading Room, bathing machines, a pier built by the London & South Western Railway from which passengers embarked for the Isle of Wight ferryboats, terraces and villas, and rapidly developed into a flourishing and fashionable watering place. In 1840 Mr. Robert Cruickshank expressed the wish to build a Church in Anglesey Village. This was strongly resisted by the Rector, Samuel Wilberforce who felt that an extension to the parish Church where more free seats were urgently needed would be of grater value to the parish than the erection of a new church not more than half a mile away. The letters which were written by Mr. Cruickshank, the Rector, and the Bishop of Winchester over this prolonged and controversial issue are still in our possession and make interesting reading. 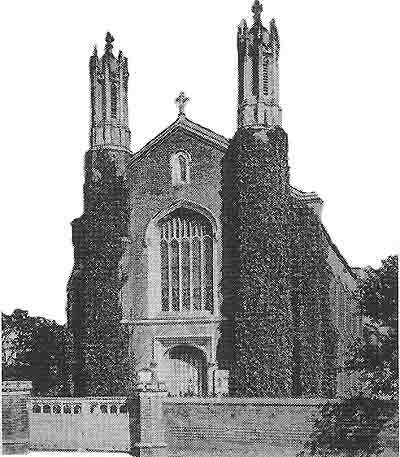 The Church of St. Mark was however built and finally consecrated on August 13th, 1844, as a Chapel of Ease to St. Mary's. After an undistinguished history, the Church was demolished in 1911. In 1840 Mr. Robert Cruickshank expressed the wish to build a Church in Anglesey Village. ● Without doubt one of Gosport's best hotels that successfully combines style and elegance with a very relaxed atmosphere. Only one woman was buried in Boot Hill Cemetery. “Squirrel Tooth” Alice Chambers was buried on May 7, 1878. The Black Death reduced the population of Europe by one third in the period from 1347 to 1351. All trademarks and / or names are acknowledged and remain the property of their respective owners. We log browser types, URLs from which visitors came to our site and pages viewed by visitors while on our site. It is impossible to identify visitors from this data. We use this information to improve the site and our ranking in search engines and directories. We do not share this information with any 3rd party. Feedback: We continue with our efforts to make this web useful and informative. We welcome your feedback or suggestions - good or bad. Please use this email link.